Kayaking Langkawi’s mangroves with Dev’s Adventure tours. 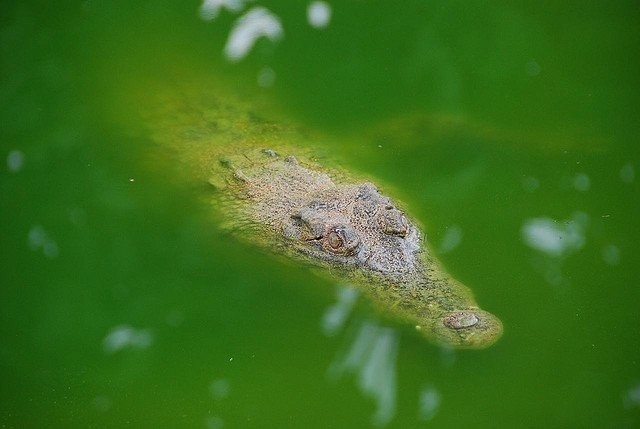 The Sungei Kilim mangroves located on the North Eastern tip of Langkawi was given UNESCO status in 2007. The rivers and estuaries twist through the park stretching 100 square kilometres while the mangroves roots and branches fight one another to swallow up the water. I held the headphones to my ears, I looked up at the ceilings to see the pale blue of the sky, angels and babies in flight looking back at me. On the wall painted in front of me was the extraordinary Last Judgement, the masterpiece of Michelangelo. To my left was a group of Japanese listening to their guide, telling them about the painting. 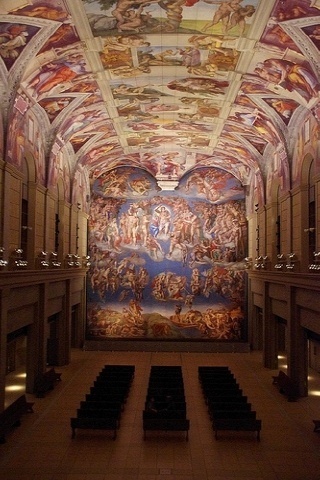 It took him four years to paint the ceiling and then 24 years later he painted the Last Judgement. 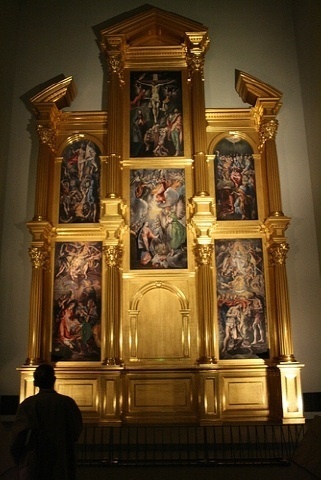 A few rooms up was El Greco’s masterpiece, The Altar surrounded by its bright gold frames and his interpretation of the resurrection of Jesus and the assumption of the Virgin Mary. 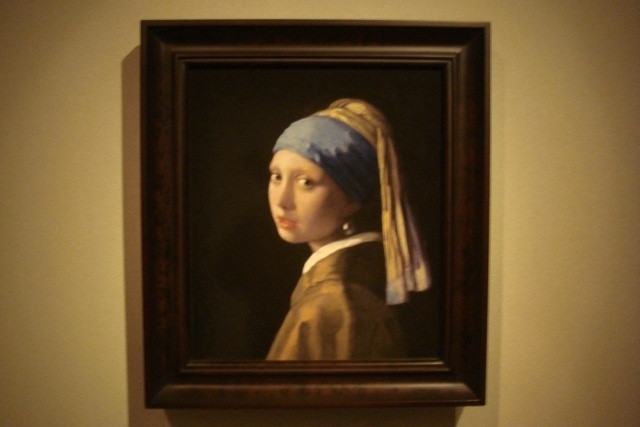 The opposite room I was lured in by Johannes Vermmer’s Woman with the gold pearl. I loved the colours of the bright yellow and blue scarf with the women’s pearl earing being the focal point of the work and then there was my favourite piece Rembradt’s Night Watchmen and how he captured the captain and the Lieutenant with his effective use of light and shadow. 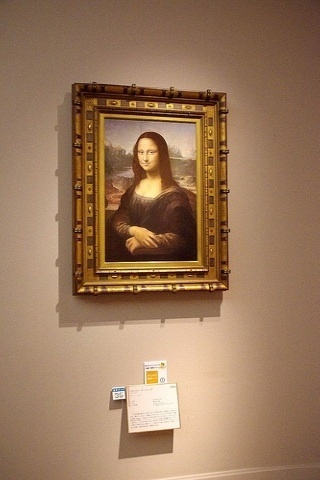 There was more though.There was Monet and his lilies, DaVinci’s Mona Lisa and art done by Picasso to just name a few but wait a minute, where can this be , these paintings are located in all different places throughout Europe. Well the story starts here. Masahito Otsuka built the Museum to commemorate the 75th anniversary of Otsuka Pharmaceutical company. When Masahito was 5 years old he recalls being carried on his father’s shoulders and being shown the site of his father’s factory. He told his father that our factory is very tiny and his father agreed but he promised his son that it would grow into a huge company and that is exactly what happened. One day when the boy, who was now president of the company was working at his office when a man came in and poured sand on his desk. “What is this sand about?” The man replied we want to make tiles from this sand after the meeting and coming to an agreement, they set up a kiln to start manufacturing tiles. On a business trip one day in Moscow in 1980 he visited a cemetery where he noticed a picture covered in plastic, but it had no protection from the ultra violet rays of the sun even though it was a relatively recent photo the portion of its face was discoloured, its colours in general were fading from here he got the idea that if we were able to have photographs printed on ceramic boards, we would then be able to produce wonderful pictures with preserved colours that will never fade. Otsuka at the end of World War 2 had 17 employees and the number of employees now exceed 23,000. 7,000 of these come from Tokushima. Having promised his father, who had passed away by now to give back to the local community. A spot was established on the Straits of Naruto to build a museum based on the concept that every visitor would be able to see the worlds most famous art. With prices this high you wonder if they are really giving back to the public or just running it as another one of their successful business ventures. Though extremely expensive it is still worth visiting if you are in the Tokushima prefecture in Shikoku. 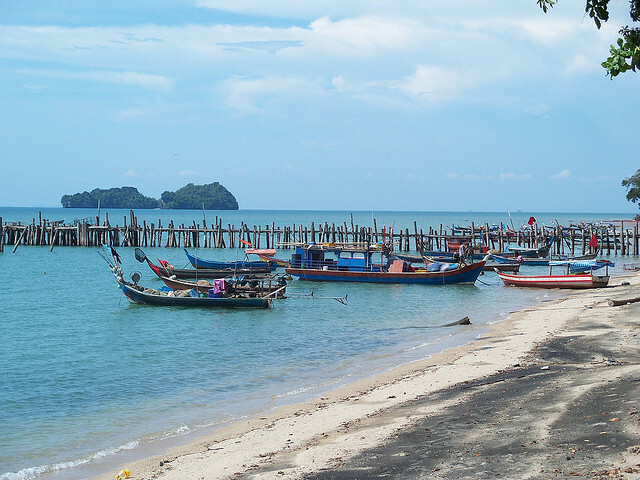 Langkawi, an island located near the west coast of the Malay Peninsula in the Andaman Sea is known for its beaches. They are supposed to be the best on the west side of the country. 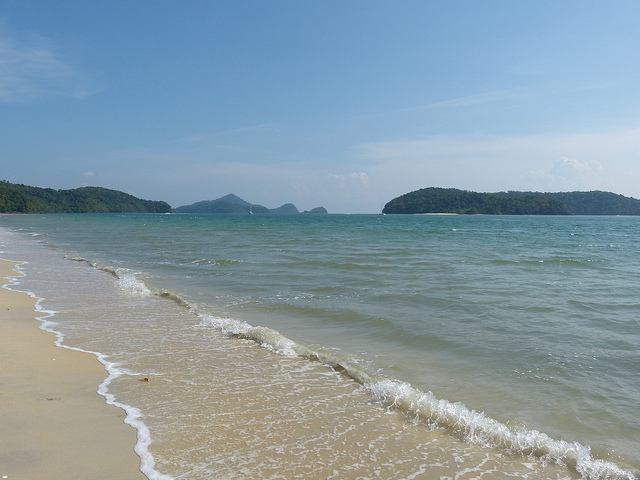 During our six day visit and being the beach lovers that we are, we visited a few of the beaches that pop up along the shores of Langkawi Island. The beaches are spread out around the island so if you want to see some of them you will need your own transportation or hire a taxi to get around as there is no public transportation on the island. One of the days we hired a taxi to take us around the north side of the island for four hours it cost us 125 RM around $40. 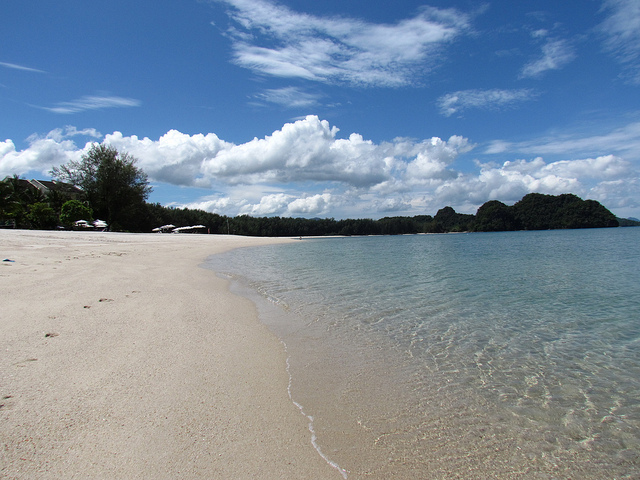 These are the beaches that we visited in Langkawi. 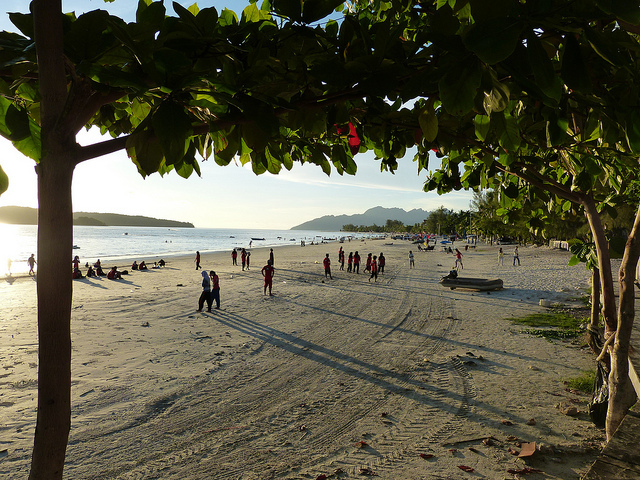 This is the main beach on the island that originally brought the tourists to Langkawi in the 80’s. The widest white sand beach on the island stretches for around two kilometres, palm trees sway in the breeze. 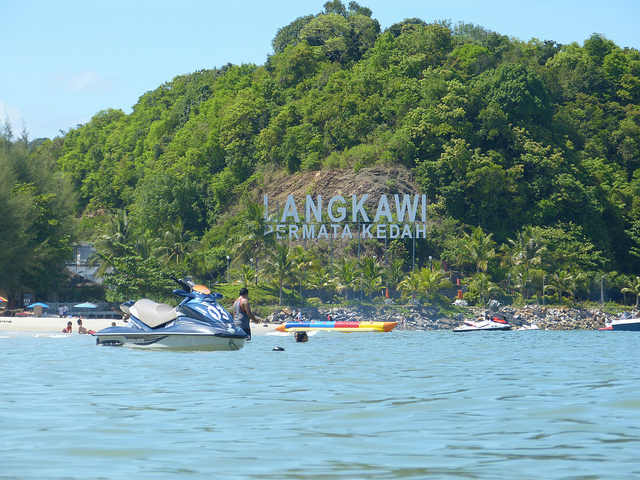 People lie on sun beds and bathe in the sun, Pulau Rebak Besar and Pulau Rebak Kecil rise from the water but it’s not as relaxing as described there is also the jet skiers, banana boats and other sea sport activities stirring up the sea. When first stepping onto the beach we were quickly approached by touts offering these rides but once we politely declined we weren’t hassled again unlike other places in South East Asia similar in status to Pantai Cenang like Pattong in Phuket, Danang in Vietnam and Kuta in Bali. Pantai Cenang though is built up similar to those beaches mentioned above. Resorts back up onto the beach. Shops selling souvenirs, junkets, swimwear and restaurants serving Malay, Thai, Middle East and western food as well as small spas performing various massages line the paved street. It may not be party central like the Thai islands or Bali but for nightlife this is the place where the tourists go but unlike other islands that have a few different areas to explore at night. On Langkawi you really have only one choice and that happens to be Pantai Cenang. Pantai Cenang may have been nice in the 80’s but like other islands it looks like it has lost its charm and has been built up to much for our liking. This beach is really a continuous to Pantai Cenang it is only separated by a headland that has the aquarium Underwater World and a large duty free shop. The beach is a little quieter than Pantai Cenang but the sand, water and views are the same. The beach width is slightly narrower than at Pantai Cenang. There are a couple of jetskiers and parasailing. There are 3 mid end scale resorts that run to the back of the beach. Some more restaurants including a USSR restaurant which caters for the Russian tourists who come to Langkawi to escape their bitter Winters. This was the first time for us to ever see a black sand beach. The beach gets its colour from the minerals in the granite bedrock. The beach is not long around 100 metres in length. The colour of the sand, the shrubby greenery of the plantation and a rickety wooden pier gives this beach a rustic appeal. We walked the length of it , took a few photos and enjoyed having the beach to ourselves for the short time that we were there. If you haven’t seen a black beach before then it’s worth checking out but there are better beaches close by. 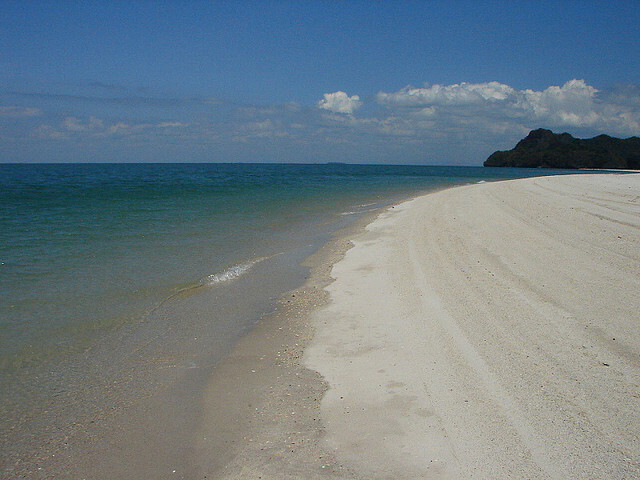 Tanjung Rhu beach is Langkawi’s number one beach and is on private property which belongs to Tanjung Rhu resort. The public have access til 7pm but are separated from the resorts guests. The sand is whiter here and the water is a shade or two bluer being in the close proximity of Koh Lipe in Thailand. The day that we were there the sun was out in full force, the beach is not protected from any shade, there are no palm trees, no beach parasols so you are left to defend for yourself from the suns rays. Behind the beach is where you gain access to the UNESCO mangroves which is one of the must do’s in Langkawi. Tanjung Rhu is isolated from the rest of Langkawi so if you decide to stay here you really only have the resort but if you can afford it then you may not want to leave the resort anyway. This is the beach that stretches behind the Berjaya resort where we stayed and was the only place that we saw a huge jelly fish washed up on the shores. 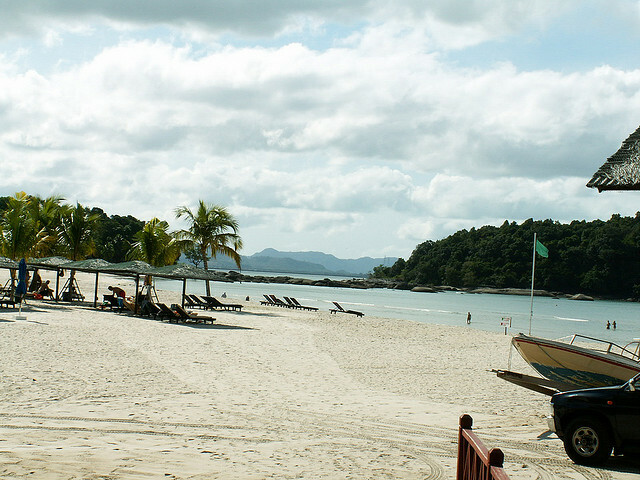 The beach offers water sports activities such as jetskis, kayaking and banana boats. There are a few islands in the sea that you may want to explore by kayak. 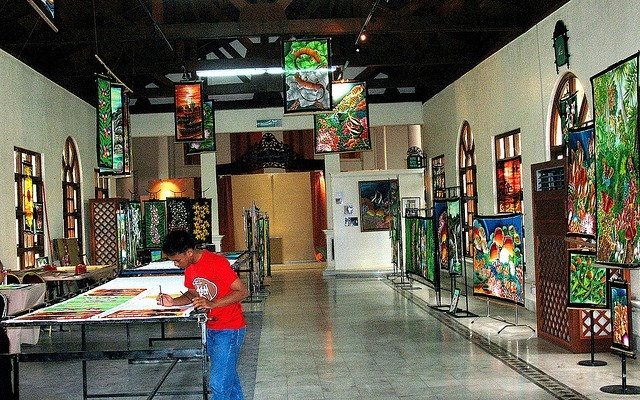 Nearby is the Oriental Village which is where you take the cable car up Mount Cinang. 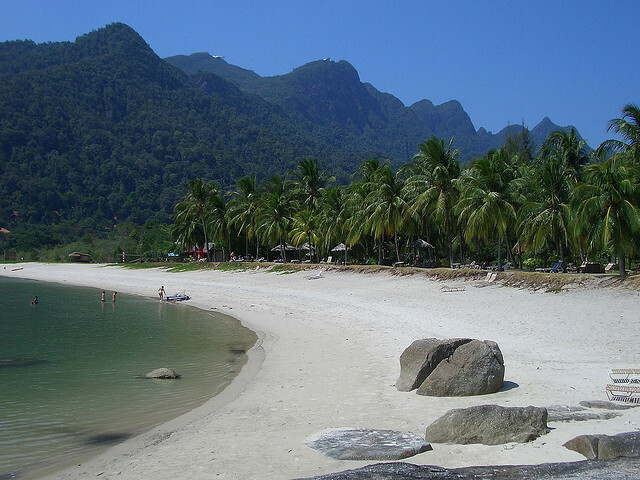 From the sea look back over the resort to see Mount Cinang rising high above the surrounding nature, the white sand and the palm trees dotted along the beach. It was here though after three of four days of wondering what was missing that it finally dawned on me that up close there is no colour in the water, the emerald green or the aqua blue waters that you see from a distance disappears from near, the waters of Langkawi have no visibility, there is no snorkeling, no coral and no fish that’s possible to see from the waters surrounding Langkawi. The beaches here are not by anymeans poor quality it’s just that rival countries nearby battling for the tourists dollars in Southeast Asia offers just a little more sparkle and colour. 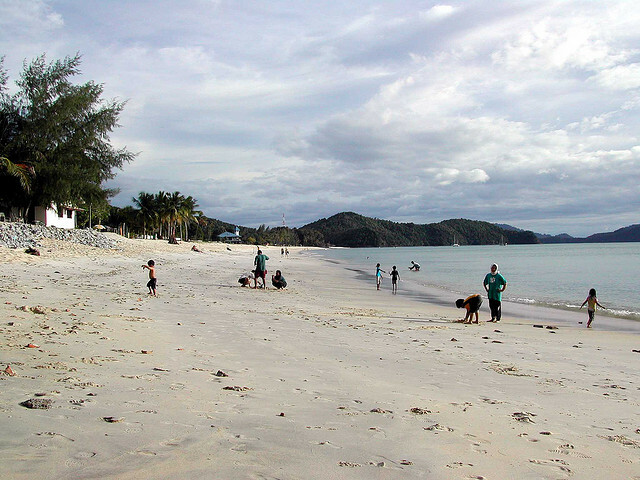 What was your favourite beach in Langkawi? 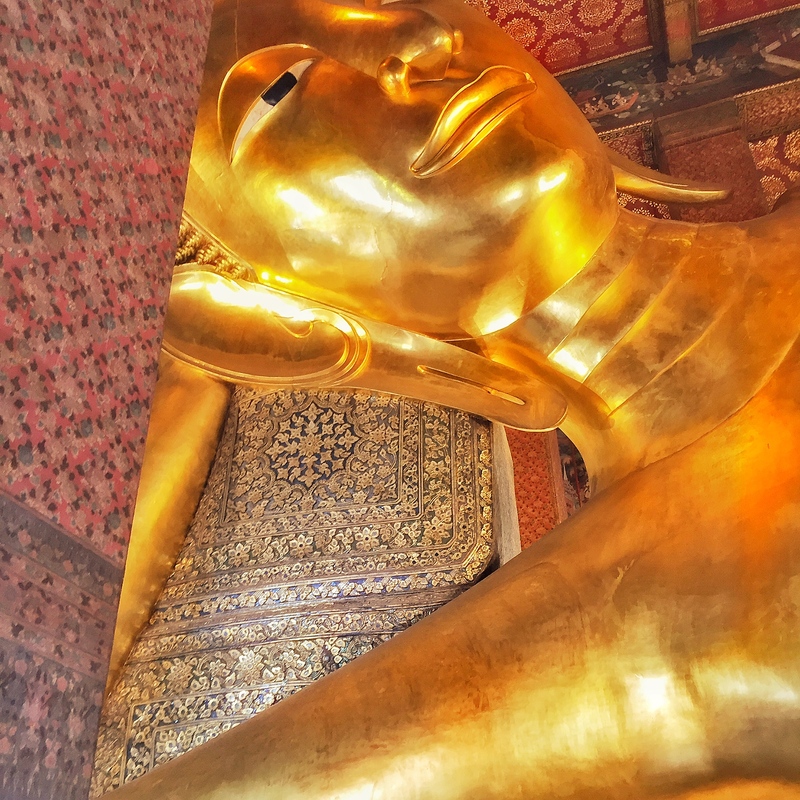 How did you find the beaches compared to other countries in Southeast Asia? Langkawi an archipelago of 99 islands juts out from the emerald green waters of the Andaman Sea. The rocky limestone peaks of Mount Cincang and Mount Raya form the highest mountains on the island while the rest of the island is covered in lush rainforests or deep green rice fields. 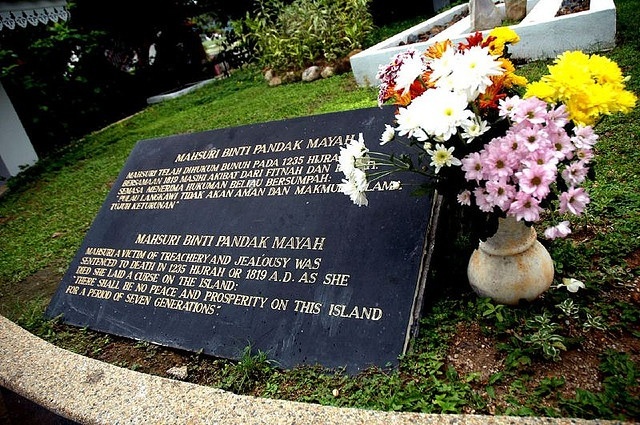 Back in 1987 though Palau Langkawi was virtually an unknown island on the tourist map until Tun Dr Mahatir became Prime Minister who was formerly from the island. He stripped Penang of its duty free zone handing it over to Langkawi, resort development began with the likes of the Berjaya resort being built and tourists started to come. Was this luck or coincidence that this all coincided with the end of Mahsuri’s curse. 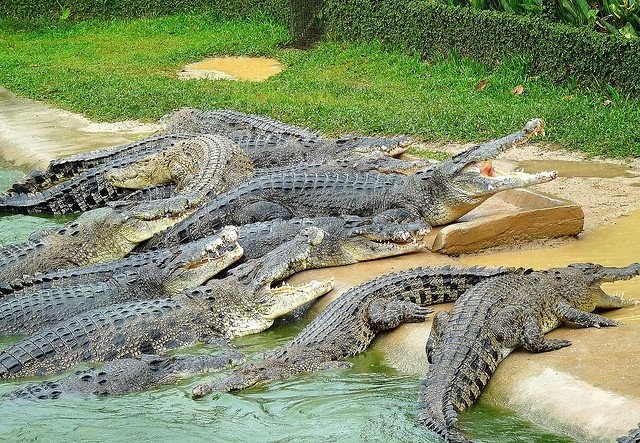 Since then Langkawi has been attacked by Siam(Thailand) numerous times. There had been decades of failed crops that followed her death. That was the past and now Langkawi prospers in the future. 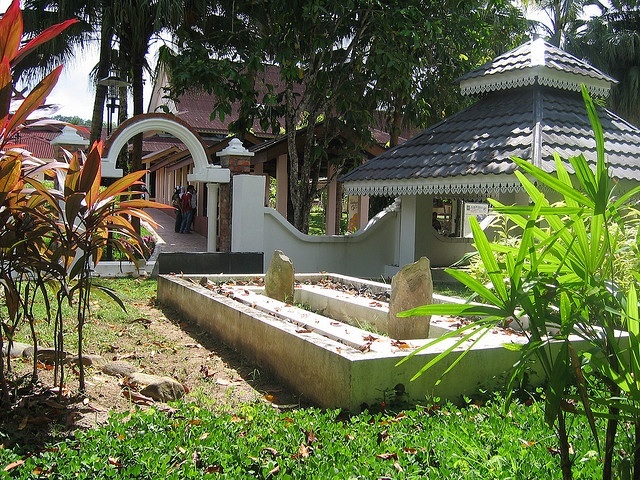 Mahsuri’s tomb can be seen fenced in a slab of white marble on the site of her death. Earlier we had ascended the peak of Mount Cincang being towed up by Langkawi’s number one tourist attraction, the cable car. The cable car climbs 919 metres and has one of the steepest gradients in the world at 42 degrees. 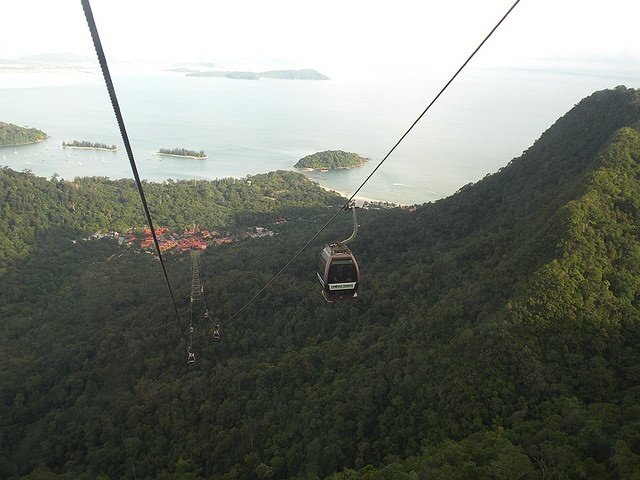 From the top on a clear day, the panoramic view covers some of Langkawi ‘s 99 islands as well as spreading as far as Ko Lipe, an island belonging to Thailand. Unfortunately the day that we ascended, the blue sky floundered behind a thick haze preventing a dynamic view. 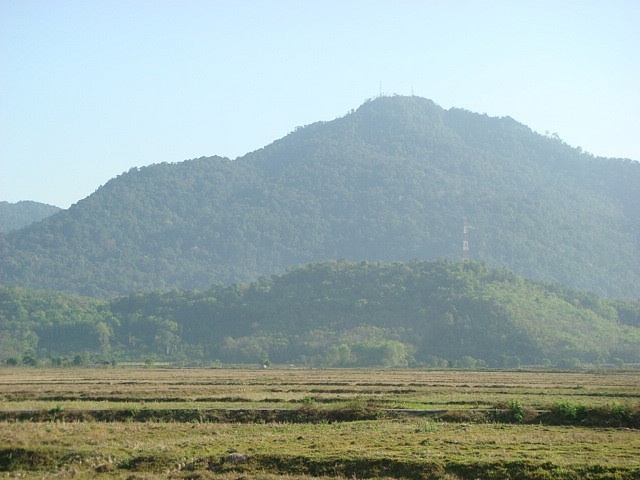 Mount Cincang is only separated from Mount Raya, the highest mountain in Langkawi by Bukit Sawar. It is believed that these mountains were not only people but they were best friends until the da of their children’s wedding when a fight broke out between them. Pots, pans and kitchen utensils were thrown at each others family. A big pot of curry for the wedding feast fell and seeped into the ground at Kuah(gravy) the capital of Langkawi. The pot of hot water was also thrown and showered down on Air Hangat, water still boils there in the form of hot springs. Eventually Mat Sawyer was able to stop the fight between Mat Cincang and Mount Raya. They were however transformed into mountains with Bukit Sawar being lodged between Mount Cincang and Mount Raya. Myths and legends make for enchanting stories as you will be enchanted with the surrounding scenery that is known as Langkawi. It’s hard to imagine that 2014 is already upon us. Each year seems to go faster and already We All Travel Together has been in existence for nearly six months, launched back in August last year. Since launching we have written 49 posts, this being our 50th post. A small milestone in its own right, hopefully we will reach many more milestones in the future. Over the course of the six months our readership has continued to grow and recently we just brought up our 3200th hit. We All Travel Together would like to thank you for the support and wish you all the best for 2014. We would like to share with you the Ins and Outs of the first six months of We All Travel Together. We start with the most read posts. The interview series that we have been conducting have proven to be successful being the three most read posts on We All Travel Together. 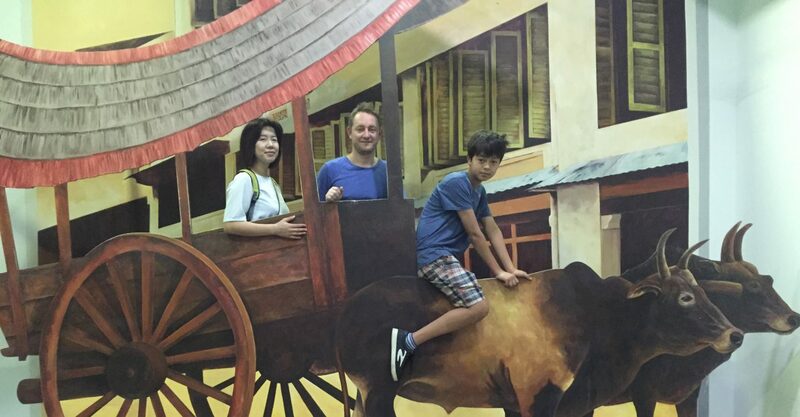 These three people are an inspirational to all travellers and can prove that anybody can travel. I would personally like to thank Sarah B Klingseid , Sonoko Nakaya and Lauro Serra-Polancos for participating. The next post to be read the most is Escape to Lamma Island,Hong Kong. This post has been moving up the charts recently with a website linking to the post that covers Lamma Island. Escape to Lamma Island was written about escaping the hustle and bustle of Hong Kong to find Lamma Island where people live an alternative lifestyle. Readers also found the Observation series on Japan and Australia to be popular as they followed one another in the most read column. In general writing about Japan proved to be a hit with the Food you should eat in Osaka, Japan’s distinctive four seasons and Going to a Japan Baseball game featured predominately . The most read posts were also the posts that featured highly with the most comments except for one which was quite a surprise. Verona, The Shakespeare experience post was only in the middle to lower range in the read column but a few comments were left. The post is about visiting Juliet’s house only to be swept along by gimmicky and tacky attractions which I called the Shakespeare experience. The least read posts are not really a surprise here because they were from a group of posts that were released in the first couple of weeks from the launch of the website when there weren’t many readers following the site but if you happened to miss some of them it might be a chance to catch up with them now. Here is a list of a few of the posts ,Madamme Tussaud’s where the wax comes to life in Los Angeles, Petrona Towers always the centre of attention, Cruising Venice’s canal, MichaelAngelo’s David verses Goliath. Bas coffee plantation, where you can find the world’s most expensive coffee. This post didn’t quite make the list in the most read posts, barely falling short but put simply the post is about coffee I would have thought that other topics in Bali would have captured the attention of the readers. Was it that we all love coffee? 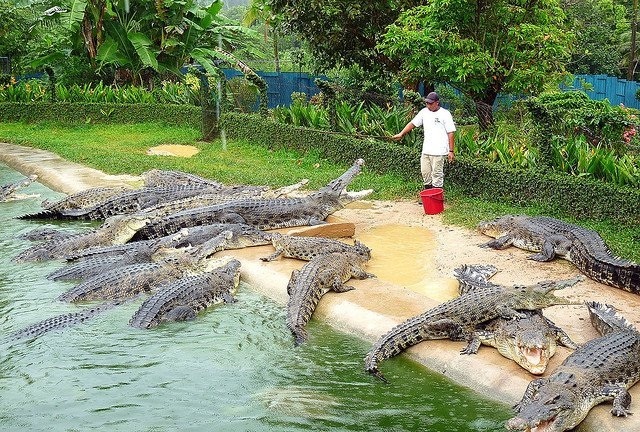 Was it that the world’s most expensive coffee gets pooped from a luwak. I thought that the post Bologna, the Italian leader of food would have gained more reads. First of all it’s about food, it’s about Italy which all people seem to love and also it is about a city that goes under the radar when visiting Italy. It’s a good post. I think Royal Selangor, the king of pewter is the best written post on We All Travel Together. I think the story is woven together showing an aspect of Malay culture and also facts about Malaysian pewter. I think it tells a story that involves a very important character. Our readers come from everywhere. You would be surprised where some of them come from Japan which is not surprising, it’s the country I live in. Japan was leading by a lot but it will be surpassed by America in the very near future. Australia is number 3, again not a surprise after all it’s the country I’m from. Australia is followed by the UK, Germany, France, Malaysia, Canada, Philippines and Hong Kong round out the top ten. We have had readers though from the likes of Israel,Kyrgyzstan, Moldova, Madagascar and Cambodia. The main goal is to increase our readership so if you haven’t registered to follow we hope you do in the near future. We would like to continue with our interview segment. It seems popular so if you want to be interviewed let us know. We would love for some of our readers to write some guests posts after all We All Travel Together is not just about my family travelling together it is about you travelling too. 2014 has just began and we have just come back from a trip to Langkawi where we spent six relaxing days. We have a hot spring weekend planned in February. Our family or my son and I will go on our first snowboarding trip together. August we currently have a trip planned to Taiwan but our minds are never made up so that could change in a second. We have lots planned and that is still only for the first half of the year.